Now we're on to the thrilling subject of compost materials. Before you know what to compost, let's first get excited about How to Make Compost if you haven't already. Compost has been made forever and a day. Apart from the obvious things like mobile phones, gold bars, harpoons and inorganic suchlikes, there are now many chemicals that won't pass compost muster. Your handy guide about what to compost safely and what not to compost. Don't put in too much of any one thing at a time, balance out nitrogen-based 'green' materials with similar carbon-rich 'brown' stuff. Cover the top with more 'brown' materials if your compost starts to smell, attract flies or gets too wet. A bucket of kitchen slops followed by the day's torn and crumpled newspaper, topped with some dried leaves or mulch, then an armful of fresh hedge clippings, iced with a spade or two of soil and a sprinkling of pine needles... you get the idea. 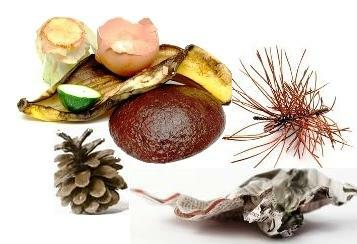 The following compost materials are fine when used in any sort of compost — hot, cold or with worms. Urine —it's sterile and recognised for its outstanding fertiliser qualities. Urine boosts the nitrogen content of compost as it is very high in natural urea. Also adds phosphorus and potassium. All in all it speeds up the composting process and provides a high quality fertiliser. Wood chips and sawdust — from untreated wood. Of course most of a piano, old sofas, cupboards and beds, if bulldozed into a pile along with organic farm and crop residues will eventually rot. Calm down... that's big talking stuff best left to farmers. For us 'umble, salt-of-the-earth gard'ners, with our backyard composting, remember the smaller the bits of material, the faster they compost. Some people blend up their veggie scraps — don't try this on the old doormat. Here's what to compost if your compost gets HOT. Your compost materials get quickly discovered by insects, slugs and worms, but first with the right conditions the metabolic heat of "thermophiles" (microscopic organisms that love heat) will get to work. Weed seeds, bulbs and perennial root clumps. Don't add any of the above food unless you use an animal proof composter or you will attract furry opportunists. Using a compost thermometer is a great way to monitor and manage your compost pile. 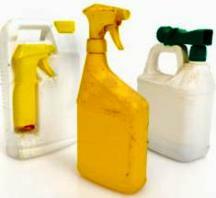 Chemicals such as synthetic pesticides, fungicides, herbicides, medicines and cleaning chemicals: NO. Most will kill off beneficial microorganisms, worms and beetles in your compost. They can harm your plants and health later, or leach into ground water. Over time some of these will break down or dissipate into air and soil, but don't risk it, check everything first. Diesel, petrol or gasoline, and used machinery oil: NO. Can be toxic to humans and plants. Kitty litter: Used kitty litter is biodegradable, but read "Solid Wastes" below. Black walnut tree — all parts from leaves to roots, as they produce a substance called juglone which is toxic to some plants, animals and us. Juglone in the leaves will break down by 4 weeks when composted as it is exposed to moisture, air and bacteria, or you can compost the leaves separately to be safe. Black walnut bark is the only other part of this tree that can be safely composted, but it needs a good half year or more. Tomatoes are a sensitive juglone plant, so you can always test the compost with a few tomato seedlings. Tough or oily leaves — palm tree leaves, banana skins and leaves, oak, holly, magnolia and many evergreen tree leaves such as eucalyptus. (shred finely or they'll take longer than your tax refund for anything to happen). Plastics, metal, foil, glue, treated wood and glued wood like particle board and chipboard: NO. Haven't a hope to compost. Any inorganic materials and chemicals like these should be put in the recycling bin. Sauces and spreads: Maybe. Some such as salad dressings, mayonnaise and nut butters will take ages to degrade so only use small bits from plates or food. Solid wastes from pets like non-vegetarian dogs, cats and birds. Also human waste: There are some strong warnings about transmitting pathogens from these manures to humans, such as E.coli, cholera and toxoplasmosis from cats, so you choose if you want to compost these wastes or not. They have been used for a long time and are valuable organic compostable material, but if you do compost non-vegetarian waste, remember, as with all gardening, wear gloves when appropriate and wash your hands well when you come inside and particularly before handling food. Dig a hole and bury it all, then plant ornamentals or a tree over the top. In several years it would be safe to use for growing edibles. Compost it in a hot compost — most people believe that any pathogens would be killed, but if in doubt, only use the compost on ornamental plants to begin with. 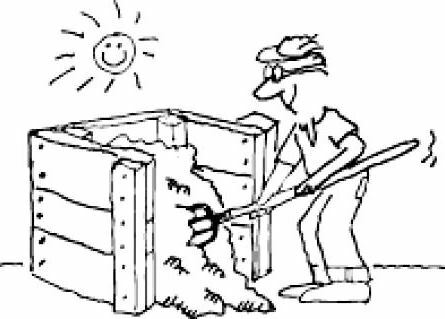 Toss it in any old compost without worrying whether it's hot or cold, but leave it for at least 2 years for any pathogens to disappear. Dry it in an unused sunny spot of your garden, then crumble (could use a concrete mixer, weed trimmer or smash with spade), then sprinkle on garden or in compost. Pile it up in an out-of-the-way part of garden. Cover each delivery with some grass, leaves, soil, straw or whatever you have and let it sit. 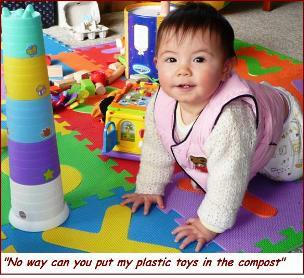 It will quickly turn into rich compost, and you can start a new pile after a while. Don't use the first pile on veggie garden for at least two years. Feed it to a worm farm, but if the animal has been recently flea treated or wormed, that will hurt the good worms. Now you've got all the facts on compost materials and what and how to compost safely, with a bit of luck, your compost is ready... black gold and you've saved yourself money — bags of money — you're up with the rich! You made it yourself — so satisfying, instead of paying say, $10 a bag to buy organic compost. Yes I know it took you months to make... about the same as a lawyer earns in ooohhh about 10 seconds, but it was thrilling wasn't it! Make sure you read this steaming pile of facts on How to Make Compost.